Happy Friday!!! I'm sorry it's been awhile since I've posted on here! Things have been pretty busy which I'll explain in another post. But ANYWAYS, I'm so excited to share more decor with yall. Today I'm sharing some details on this gorgeous new frame that I recently hung from Framebridge . The story behind this picture in this frame is that it was actually free. I talked about it in a previous bedroom decor post, but basically I sign up for Shutterfly's mailing list and they send out coupons all the time. I got a coupon for a free oversized print so I got this wedding photo printed. The problem with the picture, was the dimensions. They were so strange and after I ordered it I realized it wasn't a standard photo size (probably why it was free). Basically because it wasn't a standard size, I couldn't find any frames that fit it, and if I did, they were super expensive! I ended up finding one frame that was super cheap and I spray painted it which was a fun DIY project but I knew it would be temporary because I didn't love it. Fast forward 1 year later. I wanted to freshen up my bedroom and my cheap DIY frame was still bugging me. I knew the only way I could frame this photo was if I got a custom frame made for it. I googled "custom picture frames" and stumbled upon Framebridge. 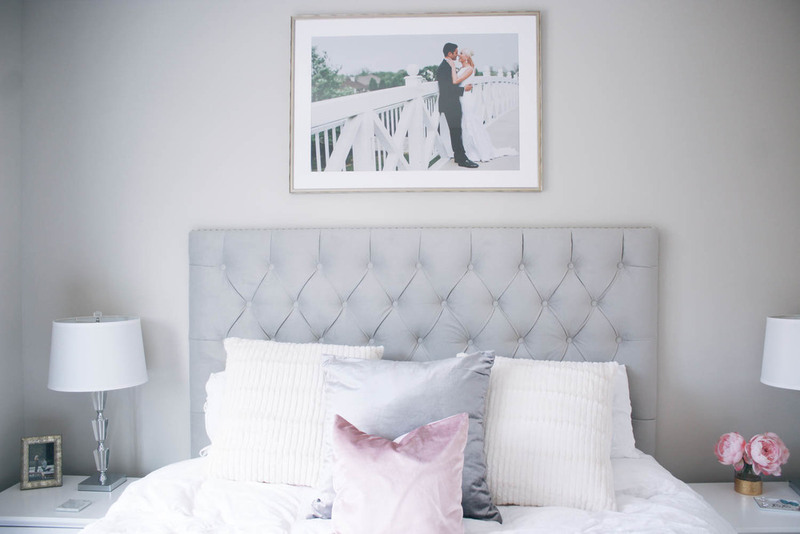 They had the best prices of any company that I looked at and it turns out one of my favorite home decor bloggers uses them, so I knew they could be trusted. They had a ton of styles that weren't gaudy or obnoxious like other custom framing companies. There were about 4 styles that I loved but I finally decided on the Newport style with a white mat. There are two ways you can go about framing your photo. You can either upload a picture that they will print and frame, or they'll send you packaging to mail in a photo that you want framed and they'll do all the framing there and send it back! Super easy! and FAST! Framebridge was kind enough to give my readers 15% off on their first Framebridge purchase with the code "LEMONBLONDE15". Happy framing! !